Home / Anarchism / Has The #BlackBloc Tactick Reached The End Of It’s Usefulness? Has The #BlackBloc Tactick Reached The End Of It’s Usefulness? With the No G20 protests in Hamburg coming closer and closer we republish “Has The Black Bloc Tactic Reached The End Of It’s Usefulness?” by Severino from 2002. Although this essay is 15 years old, its still interesting. 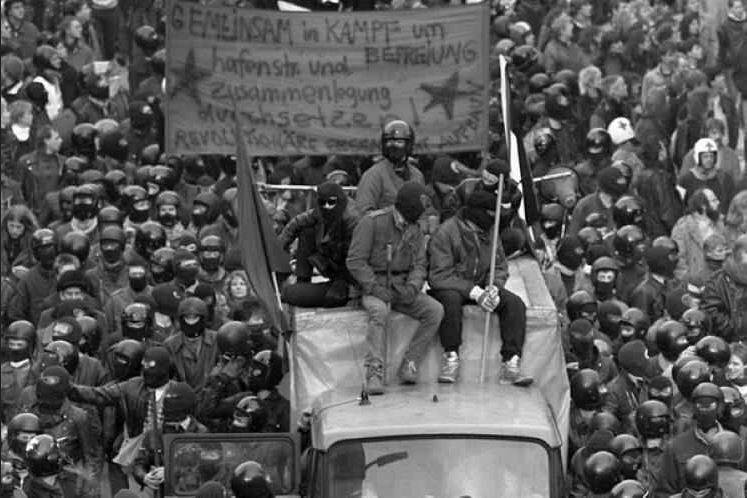 Image: Black bloc during a demo for the Hafenstraße in the 1980’s in Hamburg, Germany. Originally published in The Northeastern Anarchist Issue #4, Spring/Summer 2002. Written by Severino. As class struggle anarchists who recognize the importance of a diversity of tactics in order to attack Capital, the State, and oppression in an effective manner, we see the black bloc as an important tool of struggle. Only one tool among many, but an important one nonetheless. However, this by no means implies that we feel it to be in any way above criticism. Indeed, we are very troubled by how black blocs often operate, the manner in which actions are sometimes carried out, and the direction that some black bloc elements seem to want to head in. It is for this reason that we were glad to see the text by our comrades from the Workers Solidarity Movement (WSM). Particularly refreshing was the fact that, unlike many other texts critical of the black bloc, this one was clearly written in a comradely, honest, and constructive fashion. This is the only way in which an effective and useful dialogue on the subject can be had, and our response is with the same spirit and intentions in mind. With that said, we do in fact have several important disagreements with the WSM text, and will attempt to clarify some of our positions in this writing. This is the first question posed by the WSM article, and it is a question (and sometimes assertion) that we are starting to hear quite often in some anarchist circles. The reasoning behind it tends to vary, involving anything from the symbolic nature of the confrontations black blocs often engage in, to issues about whether or not it can serve as a tool to encourage empowerment, self-organization and the construction of dual power. In the case of the WSM text, the argument is centered to a large extent around the issue of constantly heightened security and enlarged police presence at large summit type events, which hinders the ability of the black bloc to act in an effective manner. In our opinion, this argument is flawed on two important levels. The first, is that it places all the responsibility for the failure, or at least controversial nature, of several recent black blocs on the actions of the police. To us, while indeed greater preparation and numbers on behalf of the police are part of the problem, they are actually a much lesser concern than the role played by the opportunist, reformist, and moralist tendencies in the “movement” in isolating the black bloc, and the tactical consequences for us of their actions. In both Quebec City and Prague, resounding successes in our opinion, the police knew to expect a black bloc, often made reference to how dangerous it was in the press, and tried to stop black bloc participants from arriving. There was no element of surprise, just as in Genoa. However, the difference between those two mobilizations and Genoa, was not the police, but rather the relationship between militant anarchists in the black bloc and the larger organizing groups. In Prague and Quebec City, through INPEG and CLAC respectively, the space of activists choosing to use militant tactics was respected, allowing for mutual cooperation and coordination in the days before the action. In both cases this took the shape of different zones for particular types of action or levels of risk, thus allowing all tactics to work together effectively and complement each other, while lessening internal strife. However, when organizers try to isolate black bloc anarchists in order to gain favor with the press, politicians, and cops problems will inevitably arise, hindering the ability of all involved to act in an effective and respectful manner. This is exactly what occurred in Genoa with the actions of the Social Forum. The GSF divided the entire eastern part of the city (the only part reasonably accessible to demonstrators) into three blocs for the main day of action, July 20th. These were the Network for Global Rights, composed of some moderate social centers and grassroots trade unions; the civil disobedience bloc, composed of Ya Basta!, the Communist youth, and a few others; and the pacifist/White hands bloc, primarily composed of Lilliput network people. All these blocs were within the GSF structure and had agreed to a “no sticks, no stones, no fire” clause. A space for those with militant tactics was nowhere to be found. What was implied? That we should go elsewhere. When asked why this was, GSF people responded with the very shaky excuse that, since anarchists were not in the GSF, they were simply not taken into account. Furthermore, when anarchists began meeting, to address the problem and begin effectively organizing, in Carlini stadium (Ya Basta! headquarters) it was immediately made clear by the Ya Basta! people in charge that they would have to go somewhere else. Finally, to top it all off, even though the GSF claimed to respect and desire to work with groups and people who chose to go outside of its structure, only a few hours after the posters for the International Genoa Offensive (i.e black bloc) had been put up at the convergence center, people wearing GSF staff passes could be seen taking them down. There was no co-ordination, no respect, and no solidarity. Despite this, black bloc participants did manage to coalesce and hold several mass meetings beforehand. However, since the GSF refused to co-ordinate efforts, or even accept the black bloc as a legitimate section of the mobilization, choosing instead to defame and slander, on the day itself people with very differing tactics found themselves in the same geographic locations and the inevitable problems ensued, with black bloc members being accused of being police officers, being the tool of the police to justify repression, mindless hooligans, Nazis, etc. All this was not a simple accident, but rather the logical conclusion of the relationship between the reformist and authoritarian sections of the anti-globalization “movement,” in this case exemplified by Ya Basta! and ATTAC (under the umbrella of the Genoa Social Forum), and the revolutionary anarchist movement. The fact is, these reformists and opportunists are merely using the anti-globalization “movement” as a vehicle to increase their power and influence and gain their so badly desired “seat at the table” of global capitalism. At one point they needed anarchists and direct action as a tool to gain attention in the media and assert themselves as part of the debate on the globalization of Capital. With this achieved, the relationship between them and us has radically changed, and it is this that has made the difference at the large mobilizations, not the role of the police. We, as anarchists, are not interested in watered down demonstrations, false declarations of war, or ritualistic spectacles. We are not interested in, and believe there to be no such thing as, common ground for dialogue with the rulers and exploiters of the world. Likewise, we have no interest in political maneuvers and schemes. We are indeed an “ungovernable force,” content with nothing less than a total social revolution with the aim of creating a new society based on the principles of mutual aid, workers self-management, decentralization, direct democracy, freedom, and communism. As such, we are a danger to the reformists and opportunists. We are a bad influence on their drones, we ruin their parties, destroy their spectacles and rituals, we expose realities which they seek to hide, and most importantly, by truly confronting the State and capitalism we make their phony “wars” all the more real everyday. The politicians and reformists in the anti-globalization “movement” realize this, and have for this reason begun treating us as their enemies, never hesitating to try to isolate us, hand us over to the police, or send their “pacifist thugs” to physically attack anarchists. Furthermore, a massive whitewashing of history has begun which intends to sell the lie that the anti-globalization “movement” has grown despite the negative influences of militant anarchists, when in fact it has grown precisely because of us. In light of all this many comrades are starting to see “anti-globalization politicians” as the enemies that they are, but their suggested solution to the problem is simply to withdraw from the anti-globalization struggle, and particularly the mass mobilizations. We feel that this approach is both incorrect and dangerous, as it would only serve to further isolate anarchists and anti-authoritarians, while at the same time leaving the road wide open for the total co-optation of the tide of discontent with capitalism that is currently sweeping much of the world. Combating the constant attempts of whitewashing history which seek to attribute the emergence and influence of the international movement of resistance to capital to the work of the mainstream NGOs and political parties. Constantly denouncing through propaganda and example those who seek to manipulate the popular rejection of the current system in order to benefit their own ambitions of power. We must make clear that reformists, the vast majority of NGOs, mainstream trade unions, and “institutionalized oppositions’ are enemies, not only of anarchists, but of all those who struggle for the creation of a radically different world. Clearly denouncing all those who seek to reign-in and institutionalize the growing tide of resistance and vigorously work to expose as the enemies that they are all those who seek to “dialogue” and/or “find common ground with” the exploiters of the world (for example those planning to “debate” with the IMF). There is no debate to be had, and no possible common ground. Only total rejection and war. Constantly go where they go. We must ruin their parties, crash their debates, and turn their futile attempts to appeal to power into insurrectionary events where people are encouraged to think and act autonomously, thus freeing themselves from the chains, if not yet of Capital and the State, at least of the reformist party/NGO apparatus. This way we simultaneously present alternatives (be it by speaking at their events, radicalizing a demo, breaking a window, or simply distributing a flier) and avoid the political and tactical trap of isolation which they place for us in order to discredit us and leave us open to state repression. Making clear that, while black blocs and other forms of mass militant confrontation are important aspects of the anarchist struggle, they are certainly not the only ones. Anarchists, and anarchist influences, are everywhere in the resistance (as medics, in Indymedia, in non-violent civil disobedience, as cooks, and everywhere else) and anarchists accept and embrace people of all tactical outlooks (as long as they are respectful of others). Most importantly, we must build, develop, and coherently present the anarchist alternatives to the project of the parties, NGOs, and reformist unions by continuing to develop the anarchist culture of resistance and self-management. From autonomous collectives of struggle on particular issues, to squats, to co-operatives, revolutionary unions, federations, community power organizations, and all other projects which serve to render the NGO/party/boss/union/State/Capital apparatus irrelevant while at the same time building anarchist alternatives. In order to be successful in this task, we will need all the tools and tactics available to us, and this very much includes the black bloc. Clearly, there are reforms that need to be made in the black bloc if we are to heighten it’s effectiveness and defend against some of the problems that are beginning to arise (infiltration, contradictory actions, etc. ), but that is a different article altogether. The second level on which we find the arguments made in the WSM text flawed is that of what context black blocs are viewed as operating, and being effective, in. The analysis of black blocs in the WSM text seems to be centered wholly around the anti-globalization “movement,” something which to us (and we know that the WSM agrees), should only represent one part of the anarchist struggle. We believe that the black bloc should be a tactic that transcends struggles. In fact, we feel the largest potential for future black bloc lies precisely in not being limited to summits, but becoming a regular staple of community and workplace struggles, adding an often much needed militancy and power to such conflicts. The black bloc carries enormous potential as a tool that, rather than being limited to primarily symbolic action around mass convergences, is used to reinforce class struggle at the grassroots level. Indeed, this is not something unheard of, as, for example, the historical significance of the role of black blocs and street-fighting in the struggles for housing, against gentrification, and against street-level fascism in Europe (primarily, but not limited to, the Netherlands, Germany, and Italy) and in struggles in South Korea (not waged by anarchists, but in terms of tactics, clearly black blocs) cannot be denied. Other recent examples include the tactics employed by the Anti-Expulsions Collective in Paris during the immigrants struggle of ’97–98, which included storming police offices, using mass militant action to stop trains being used to deport immigrants, and inflicting massive damages on hotels used as temporary immigrant detentions centers, or the black bloc in the U.S. which recently took action against Taco Bell in solidarity with workers struggling for union recognition. These are all clear examples of black blocs, or at the very least black bloc tactics, being used to reinforce class struggle through the use of methods and tactics that other people, for a variety of reasons, are either unwilling or unable to use. This by no means is to imply that other tactics cannot be as, or more, militant. Nor are we arguing that black blocs are any sort of vanguard of struggle. Clearly, this would be an exceedingly narrow conception of militant struggle. We see them rather as an appendage to struggles that, because of its militant and anonymous character, can at times be used to advance and intensify struggles. The WSM text, in our opinion, presents us with a false dichotomy by pitting effective and organized direct action against mass actions of a participatory nature. As anarchists, we believe firmly in the ability of people to take mass militant action in a fashion which is simultaneously effective and participatory, democratic and decentralized. Again, drawing from our experiences in the anti-globalization “movement,” we can see examples of incidences where, despite all the harassment from the forces of repression (both the state’s and the anti-globalization “movement’s”) many hundreds of militant anarchists were able to come together and organize their actions in a participatory and democratic manner via general assemblies. This was the case in Prague, Gothenburg, and Genoa, to give some recent examples, where the black (or blue as the case may be) blocks were organized in an open manner with very broad (as far the anarchist movement goes) participation and involvement. This said, we do agree that the real victory lies not in the “military” feat of shutting down this or that summit or gathering of the rich, but rather in forcing them to cower behind thousands of armed thugs, denying them legitimacy, and bringing forward the contradictions that exist in class society. We further agree that the most important and significant aspect of mass mobilizations lies in the large scale experiences of self-management and direct democracy that they provide, not only for us as anarchists, but for those who believe these ideas to be dreams unworkable in reality. So indeed, we must strive to maintain that character of participation and anti-authoritarian democracy. However, again, to us, it is the stifling influence of the political elites that seek to build their future on the back of “anti-globalization” (the ATTACs, Ya Basta!s, and Bonos of the world) that is killing that spirit, not black blocs or militant confrontation. All this having been said, we do believe that there are also times when other tactics and methods of organization are warranted, because of the risks involved or other security concerns. We firmly believe that actions of this sort can still be very much positive in the advancement of anarchist and anti-authoritarian ideas when organized with a strong regard for security culture, via networks of trusted affinity groups, and in line with anarchist principles of voluntary association. The critical difference between anarchists organizing in this fashion and Marxist-Leninists is the conception that the particular groups has of itself. Evidently, Marxist-Leninists see armed or underground formations as revolutionary vanguards. On the other hand, anarchist or anti-authoritarian influenced groupings try to serve as appendages to struggles, to complement them through other means, much like the Autonomous Commandos of the Basque country, who carried out actions to aid striking workers or against the forces of repression, or Direct Action and the Wimmins Fire Brigade in Canada, who also sought to advance ongoing struggles by bringing attention to them, while at the same time radicalizing their character. We are indeed opposed to the fetishization of the black bloc, which leads, among other things, to the phenomenon of black bloc spectators as well as “black bloc as fashion.” We further agree that the black bloc, being but one tool of many available to us, is not appropriate for all circumstances. Indeed, for it to remain effective, it is imperative that it be used intelligently. Also, like the WSM, we see some serious problems developing within the black bloc tactic that merit serious attention and open discussion. However, while we cannot stress enough that we are open to discussions of militant tactics and strategy, we feel that discussion around the issue is often tackled from an exceedingly narrow and short-sighted perspective. This often leads to an analysis that we deem to be significantly problematic and that could have important consequences for anarchism as a serious political movement. First, this analysis views black blocs solely within the context of the anti-globalization struggle, and more precisely, the mass convergences that often come with it. To us, these mainly provide outlets for symbolic action, while the greatest strength of black blocs, when used appropriately and organized effectively, is real direct action used to advance day to day class struggle, in the form of strikes, housing occupations, anti-fascist struggles, immigrants rights struggles, etc., all of which are fronts on which the black bloc tactic has already proven it’s efficiency and value. Furthermore, this line of thinking places a dichotomy between effective militant action and participatory and directly democratic forms of self-managed struggle and organization. This is dangerous in that it threatens to dissuade anarchists from using what is very likely our most powerful weapon; our disregard for legality and our willingness to engage in militant mass confrontations, coupled with confidence in the ability of people to organize themselves to take back power and control over their lives. Finally, by identifying the battle between police and militant elements as the prime motivation for the increasing difficulty of revolutionary anarchists to find a place for themselves in the anti-globalization “movement,” this outlook ignores the quite blatant reality of a “movement” being rapidly hijacked. A “movement” being hijacked by power seeking reformists and opportunists, who need to isolate and discredit revolutionaries and all those who maintain that a profound change in society is not only desirable, but possible and viable, in order to harness the growing power of the anti-globalization backlash. These are the Lenins, Trotskys, and Stalins of our day, willing and able to persecute, betray, discredit, and isolate anarchists in order to advance their ends. Movement criticism and analysis are indeed important things, but this is a case where looking inwards by placing responsibility for the State’s escalation of repression on militant tactics risks making us blind to the challenges we face from within the “united front” of anti-capitalist groups. This has been one of the most painful lesson of anarchist history, and if we are truly striving for an authentic anti-authoritarian revolution, rather than another change of masters, we should endeavor to not make the same mistake again. The spelling error in the headline is a pity.